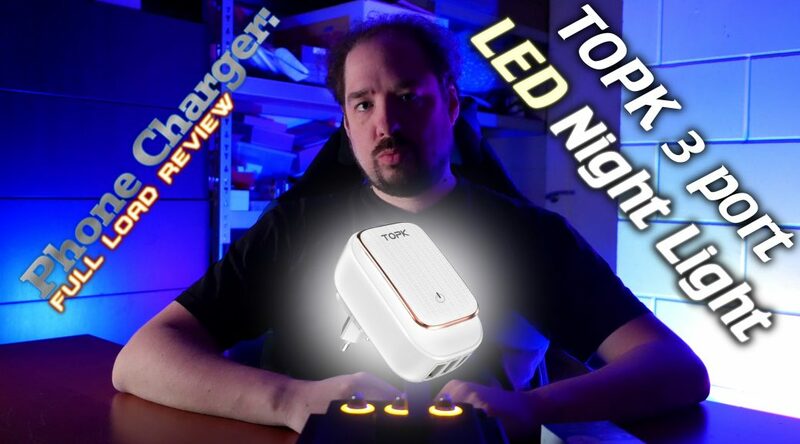 While looking around for interesting chargers, I came across this TOPK charger which has a built-in night light. Often, combined products fail at the multiple tasks they set out to do so I decided to order one and test it out. The results surprised me! As always, let’s start off with doing a video review of this charger. I’ve tried to at least make the intro a bit funny, hopefully you find it entertaining and useful to watch! This charger is a 3 port charger with an output op 3.4A max on the box. It has no special Quick Charge or any other functionality listed, other then the “auto id” power regulation it says it has. Whether you watched the video or not, here are the testing results! Basically, the charger is able to deliver up to 4A (Max of my load) while sustaining a very stable voltage. Nothing to complain about here, excellent even! This charger should be able to power a Raspberry Pi 3+ without issue! Well, that didn’t change anything at all? Great result, voltage remains stable throughout and again we hit the limit of our tester before the charger gives up! Ok, that again seems to do excellently. Once we reach 2A (+4A) the charger shuts off and enters hiccup mode until power draw is lowered. Excellent, that’s my favorite type of signaling that you are overdrawing the unit! And indeed, we see a slight change. Instead of reaching the full 2A on my tester, it fell short at about 1.9A. That means the internal power supply is unable to deliver more then 6A and has been regulated to go into hiccup mode if anything is drawn above that! Very nice! For the temperature and length load test results, please the video! Links will go to either and/or Aliexpress, Amazon or Ebay. If possible, the link will offer you a choice of these options! These are all affiliate links and buying one using one of these links helps out me, my blog and the YouTube channel, thank you! This charger!! This charger did so much better than I expected it would! As I started out saying, often these “night light” devices are utter trash. But not this guy, this is a very competent charger with a nice and well executed night light feature built-in. The charger also features verified overdraw protection and temperature protection. Although delivering a maximum draw of 6A, it won’t be able to sustain that longer than a few minutes, but something like 4A is no problem!